I finally caved and upgraded (necessarily, since I want to keep submitting products to DAZ). The fix dup script has worked fine. The rendering etc. seems a little quicker and more responsive, even. I've got the compression etc. pretty well figured out as well. The improved transfer utility hair conversion is very nice. The only problem I've had so far has been a memory leakage issue with more than one instance of the program open. It was filling up my little SSD and lagging Windows 7. I moved my virtual memory paging file to my secondary hard drive, which is much larger, and so far this seems to fix it. Also a short fyi in here, as the beta thread will probably be dropped soon: Daz Studio Pro 4.5.1.6 is available via reset of the regular (non-beta) history. Hello, here`s a quick question, sorry if it was covered on the previous 63 pages. Is there a known color issue with UberSurface(1) on DS 4.5, or does it require an extra download ? I like the V5 Valerie skin a lot, but with 4.5 it turned quite red. There seems to be a slight color/saturation change in general, but on that skin it`s really massiv. Haargh. I spoke too soon. Updated to 4.5.1.6. Now I can't render at all. With any MLIE layers in the scene and/or more than one Genesis with a body texture it hangs permanently on optimizing images. Has anyone else had this problem and/or is there a fix? Killing tdlmakes doesn't do it. It just proliferates again instantly. EDIT: I rolled back to 4.5.0 etc. Didn't fix the problem but did increase stability and decrease in-scene lag. What it apparently can't handle is a shader with transparency being applied over a transmapped hair. This is annoying, as I really wanted dirty hair for the scene, but at least it's rendering now. ...Sounds like a new memory leak issue. Guess I'll wait on this update as I feel rather fortunate (and more than quite surprised) this actually worked on my old system. I bought Daz Studio Pro 4 last year with a serial number. I got Daz Studio Pro 4.5 free and my question is do I use my Daz Studio Pro 4 serial number for Daz Studio Pro 4.5? Yes, you can use your bought serial number (in fact, paid serial numbers activate Decimator, which isn't with free serial numbers). I had been using Daz Studio 4.3 with no problems except with the grime-inizer and goredom ect shaders which would stop showing in the scene. I have just installed Daz Studio 4.5.1.6 Pro to see if the new version would fix the problem and also to use some of the newer genesis content for 4.5. Now all my previous saved scenes load with multiple problems of figures and textures not loading, the interface lags so much it is unusable and is constantly telling me it has stopped responding and crashing. If I try to render a saved scene it is optimising images forever and giving out numbers of images it is trying to optimise which are far higher than are in the actual scene. The scene I was working on for over a week is for a contest entry and is now unusable and I am eager to get this problem fixed as I am running out of time to get it finished. I was kind of wondering if there was going to be a Mac version of Mimic Live. No way to lip sync in 4.5 I can see ATM. This seems to be a far too common problem with old-type scenes saved in earlier versions. I have similar hiccups with D|S3 (and some earlier) .daz scenes, and as far as I can tell both versions' directory settings point to the same content locations. But still, 4.5 seems to be unable to find random things. The scenes do still load perfectly in D|S3 — if there's a pattern to it, I can't see what it might be. Ideas, anyone? Thanks so much for the replies SpottedKitty and fixmypcmike, I am using Win 7 Professional but there was no content in Program Files/Program Files (x86) hierarchies and the directories looked the same. I did some further testing in 4.5, I created a new scene with the figures and props it had a problem with in the saved scenes and they all loaded fine but then trying to click around the interface there was still an extreme lag, odd screen flashes and crashes making it unusable, I did not get as far as rendering. I have rolled it back to 4.3 for now as I just don't have the time to spend sorting it out which is a shame as new content is being released that only works in 4.5. I will have another go when I have more time. Thanks for the help. If you also mean "identical in both D|S3 and 4.5" they can't be. I have the D|S3 Content linked in for 4.5, but there's no point in putting the D|S4.5 My Library in D|S3, since nothing in there will work. Or would it simplify (some*) things if I migrated the My Library files into Content and change the D|S4.5 directory settings to match? Does anyone use the Layered Image Editor? My workflow with Photoshop is dependent on it (can't rely on that flaky bridge), and it seems the paradigm for layer settings management has fundamentally changed. Gone is the DSI file (glad I didn't get around to writing scripts to manipulate it!) with the layer settings now stored in the project DUF I suspect. But the killer for me is the inability to edit the current layer set -- instead of simple editing, 4.5 seems to spawn an integer-incremented duplicate layer set. The settings of the duplicate you're allowed to change, but there's no 'Save' or 'Save As' option to overwrite the original. If you change or remove the integer increment to an existing layer set name, you're kindly reminded that the name must be unique. And that's it -- roadblock. As often as I tweak the LIE settings, managing layer sets would get really messy very quickly. So I'm back to 4.0 for a few weeks or months 'till this issue gets resolved. It was with great anticipation I loaded the recent bug-fix release, hoping this most-obvious of problems (please see original post above for description) had been fixed. But evidently it was not, as I soon learned -- had closed-out all WIP relying on legacy LIE functionality expectations, and upgraded to 4.5 about a month ago. But I cannot move forward with any design elements dependent on LIE until this issue is resolved. Richard Haseltine, Szark or other highly-decorated Guru Emeritus, are you out there? Is there something simple I'm missing enabling true editing of an LIE 4.5 layer-set? Is LIE being deprecated in favor of some other paradigm? Please advise, I need to know -- my workflow is partially paralyzed! Attached is a graphical screenshot overview of the issue. No, you should be fine keeping them separate, as long as they're listed as both DS format and Poser format and aren't in Program Files. I see the behaviour you describe, but when I click Accept the settings are updated so I'm not quite sure why the changing internal name is a problem. However, it is true that without a DSI file it's not clear how to apply a layer stack to a different material zone (the layered image preset acts as a Materials preset, affecting named surfaces, rather than a shader preset, affecting selected surfaces). 1) Access to a defined layer setup can't be easily scripted. The internal name is a 'moving target' since every time you tweak it, the name changes. Ergo, tweak a given layer setup, and now be compelled to edit any and all script references from the previous internal name to the new internal name. Bottom-line is regressive time-savings over the previous behavior, effectively discouraging increased LIE scripting automation. 2) As stated above, every time you tweak it, the name changes. But not only does the name change, the old name sticks around. Now imagine a world where we can't edit documents, only move forward with incremental revisions. For some documents with only a few revisions, that may work OK, But for others, with dozens or hundreds or thousands of revisions, managing the incremental copies will quickly get overwhelmingly cumbersome. Such is my workflow now with these incremental layer sets -- overwhelmingly cumbersome! Granted some services like Dropbox manage the incremental copies 'behind-the-scenes', but the 'current copy' paradigm is maintained for the user at the front-end. 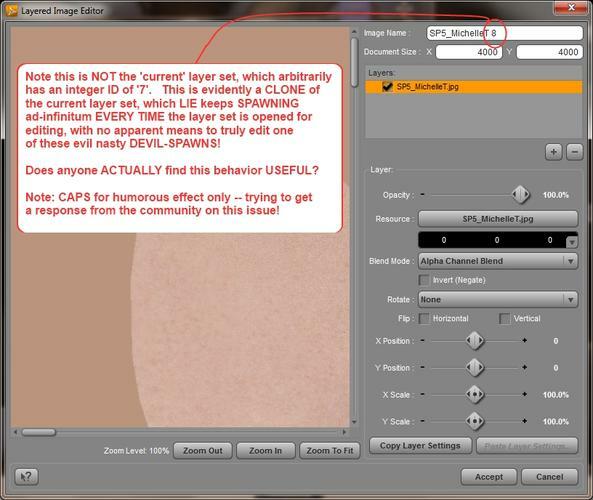 However there is a simple fix -- just allow users to edit the 'current copy' of a layer set, instead of a spawning and forcing edits on a clone. Shall I write a bug report? Yes, I would put in a bug report - possibly as a feature request, since you ar asking for a changed behaviour, though you could say it's an actual bug since it breaks things that could be done before. Do we know if they fixed the Subdragon issue or if it it is still not compatible to the existing morphs and poses? I need to know if I should by the subdragon separate before I upgrade to 4.5. Thanks. I'm a little confused. I downloaded the new Daz 4.5...am not going to get the latest version as I have been reading there are problems. Anyway...when I first got Daz4, there were a whole bunch of files I needed to download, like content creator toolkit and the auto-fit tool, etc. Do I need to re-download these other items again, to work with the new Daz? Those are included in the main installer. The only separate installers are the GoZ Bridge, the Photoshop Bridge, and the default content (Genesis Starter Essentials). If you purchased the Dynamic Clothing Control. reset for the new version. You should also uninstall the CMS manually before installing DS4.5. I recommend the latest version, 4.5.1.6 -- if you find it isn't working for you, you can uninstall it and install 4.5.0.137 or 4.5.0.116. You won't need to reinstall the Genesis Starter Essentials. Trekkiegal, a friend of mine, told me Daz4 gave her so many headaches with crashes and lock-ups that I think she went back to #3. As with any update, experience is mixed - but a lot of people are not having problems. Im really wondering should i download 4.5? slowing my old machine down terribly. I rarely use DS any version. and i really like my Cararra7 standard. I still use bryce 6.3 and prefer it over B7pro. DS 4.5.1.6 installed fine for me (I manually uninstalled my previous version first), and so far it's functioning perfectly. But after using it for a few days, I suspect that renders are quite a bit slower than in the previous build of 4.5. Anyone else seeing this? I found that I could only put two genesis characters in a scene on DS4, hoping the 4.5 will be able to handle at least one more. Have just installed 4.5 after numerous freezes and crashes with 4, so will test it out. I just installed 4.5 on my Mac running Mountain Lion. When I try to save a scene file the only thing being saved is the *.duf file. When I try to reopen this file it says there are missing assets and won;t reopen. Anybody have any ideas?